At this morning’s farmer’s market, the vendors were petering out. Gone is Lou, the tomato, melon, and pepper man; only one more week for the wonderful pear lady. The berry vendor’s time is short, too. 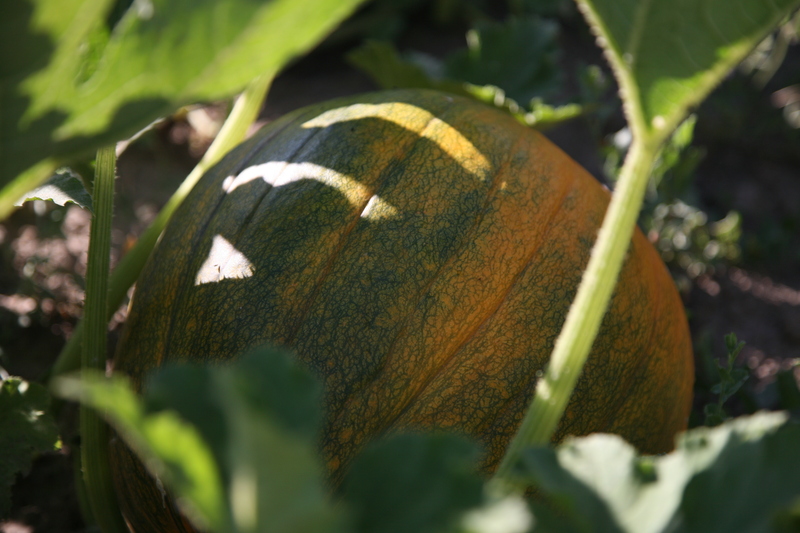 Pumpkins and winter squash are starting to appear alongside peppers and tomatoes. And suddenly, for the first time since we started marketing, I found myself wearing not only a sweater but also a fleece jacket to protect myself from the cold. For weeks, when we had nothing to sell but greens, we had nothing but 100-degree weather. Now, suddenly, September has turned the corner into Fall — bringing with her foggy mornings that stretch out nearly until noon. It seemed so strange to watch customers arrive at the market all bundled up in sweaters, pants, and fuzzy hats — when just last Saturday it was a sweltering 100 degree day, and tanktops and straw hats were very much in vogue. But there are two good things about Fall. (Well, there are many good things about Fall, not the least of which is winter squash and its good friend, soup weather.) But back to my top two: it’s incredibly useful for keeping greens fresh. No more battles with the umbrella and water spritzer to try and rebreathe life into wilted kale, chard, bok choi, or lettuce. And it means that the sunrise is getting later and later. These two items led to a small miracle at Foggy River Farm: the night-before harvest. Rather than harvesting with headlamps in the dark (which is pretty inefficient, not to mention not particularly pleasurable), Emmett and I tried a Sunset Harvest. We worked hard, but the evening was so beautiful — cool, but not frigid, and with a gorgeous pink-glow sunset — that we barely noticed. And best of all, we got to sleep in this morning. Granted, sleeping in translates to 6:30: Emmett ran over to the field to quickly harvest corn and squash blossoms while I tended to the chicks. But boy, did it feel good not to wake up in the pitch black — no morning rush, just an easy trip to the farmer’s market and a leisurely set-up. Best of all, the greens were fresh, thanks to our all-natural, no-energy-required refrigerator: they spent the night in harvest bins, topped with wet towels, cooled by the chilly Fall air.